The purpose of this introductory section is to prepare you conceptually and technically for the materials presented on this site. We will start with a discussion of the technical requirements of our materials. Then we present a short section to prepare you for learning online. For some of you, this material may be part of a hybrid learning experience in which you also meet face-to-face with an instructor. Some of you may be taking this course solely online, with a lot, a little, or no interaction with an instructor (depending on your needs and preferences). We discuss learning strategies for these different types of learning environments and give you some pointers for using this material to support your learning. We then introduce some important concepts and discuss what statistics is all about—the “Big Picture” of statistics—and look at how the four steps in the Big Picture connect to the units we present in our course. We appreciate any comments and suggestions about the materials, welcome any questions about the concepts or content, and most certainly encourage notification of errors of any kind! If you are enrolled in a course using these materials, you should post such comments on the appropriate course discussion boards otherwise contact Dr. Yichao Yu directly. Most links (even to outside materials) will load in your current window. If you wish to keep your current “starting” page available, open any links in a new window or tab using “right-click” or keyboard shortcuts. Throughout these materials we have numerous videos from many sources. The audio levels among these videos may vary. To avoid any issues with videos which are louder than you expect, we suggest you set your volume fairly low as you begin each video and then increase the volume to a comfortable level. It is important to be aware that YouTube will, by default, decide on the quality of the video based upon certain factors. You can override the default by choosing a higher or lower quality. A higher quality can be important for software demonstrations where you need to be able to easily read the small text in menus in order to be able to follow along. 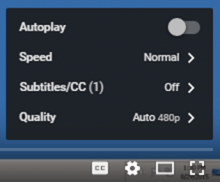 You also have the option to speed up or slow down the video. This can be very useful! The image below shows the location of this setting in the lower right corner of YouTube videos. Explanatory content: This is the informational content of our material. It consists of short passages of text with information, examples, images, videos, and explanations. Learn By Doing activities: Learn By Doing activities give you the chance to practice the concept that you are learning, with hints and feedback to guide you if you struggle. Did I Get This? activities: Did I Get This? activities are your chance to do a quick “self-check” and assess your own understanding of the material before moving on. Many Students Wonder sidebars: These short passages provide supplementary material that you may find interesting, but that is not necessary to understand the main concepts presented in the course. Software Instruction and Activities: Online tutorials and examples are provided for two statistical software packages, SAS and SPSS. You will be directed to the appropriate tutorials during the course but you are welcome to browse these materials at any time. The above list relates only to the material presented in this open learning textbook. See your syllabus and schedule for information regarding assignments and other requirements for your course.